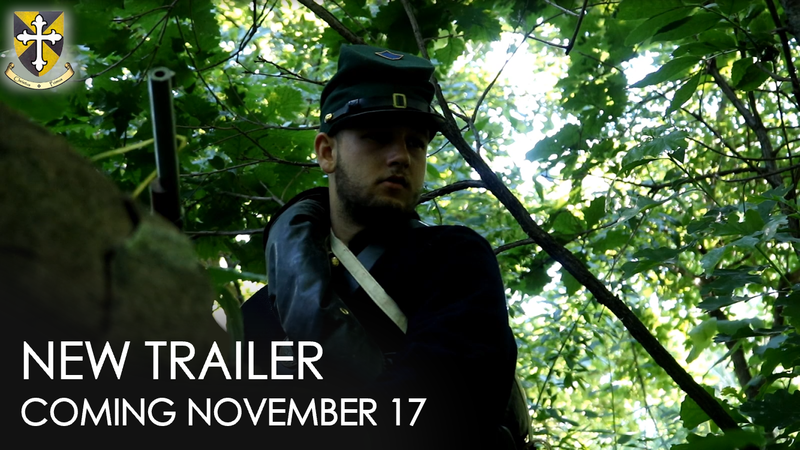 In 2016, my brother and I started work on a short film set during the American Civil War. Since then, we've come a long way. In 2017, we received permission to shoot our film at a local state park and began the filming process. By the end of the year, we had a first draft put together and started looking for score composers and sound designers. In 2018, we found a score composer for the opening of the film, and found a sound designer for the whole thing. Over the course of the year, we've slowly but surely been working with them. Finally, about a month ago, we sent our final draft of the film to the sound designer to work on. As things stand, we hope to have the short film released before the end of the year! Anyway, without further ado, I'm pleased to present a short teaser trailer for the upcoming film! Enjoy! Haha, thanks Butzell! That's why although we set the story in Gettysburg, no actual units or locations are mentioned in the movie. The focus is on the individual soldier. This looks really good Hotlead! I like it, look forward to the finished product. Thanks Lip! I’m looking forward to releasing the full version too! Can’t wait for what next! keep pushing. Thanks Hess! We certainly intend to keep pushing. Thanks Klieg! I've never heard of Johnny Reb! Sounds interesting - what's it like? Its a miniatures wargame. Very entertaining, but if you simulate one of the larger battles, it can take weeks to complete. When we lived in Hawaii, my wife and I played a battle out for 3 months, before she ultimately won, damn canister-shot cannons nearly wiped out an entire regiment of mine (She still wont let me forget about that particular game). Oh, and if you ever do play it, dont attempt to Cav charge a defensive position, very bad news, and apparently I'm not Custer. Haha, that’s awesome! Don’t know if I have 3 months for a game though...my mom would start to wonder where I’d gone! Salute all! The 2nd trailer is out; the full film goes live on December 15th! One shot with a muzzle-loader. What a different world, what a different battle! Maybe two, then bayonets and butts! Not to glorify, but to remind. Brave men, brethren to us all! A conflict that gives meaning to the word "conflict". Hi guys! With the film set to release next month, I thought it would be cool to post a bit about some of the film's historical backdrop each week leading up to the release. This week's topic? The Sharps m1859 rifle. In a day and age dominated by muzzle-loading rifled muskets, the Sharps rifle was a weapon ahead of its time. Where the standard Enfield and Springfield muskets used minié balls and black powder poured down the barrel, the Sharps rifle used cloth cartridges that were loaded from the breach. This revolutionary new development allowed soldiers to reload while prone or behind cover. It also increased the firing rate of a soldier dramatically. Well-trained soldiers with standard muskets could fire about 3 shots per minute. In contrast, according to one source, soldiers with the Sharps rifle could fire a withering 8-10 shots per minute. Of course, a weapon this good had to have its downsides. For the Sharps rifle, it was the cost. Much more expensive than the standard musket, the Sharps rifle would not see action with the general infantry. Instead, it would be given to an elite force on the battlefield: the 1st and 2nd United States Sharpshooters. This weapon was ideally suited for the sharpshooters. Somewhat experimental in nature, the 1st and 2nd US Sharpshooters did not adhere to the traditional rank-and-file tactics as closely as their infantry brethren. Often, instead of taking part in line-firing, sharpshooters could be found in concealment taking out high priority targets from a distance. These high priority targets included officers, artillery battery members, and (of course) Confederate sharpshooters. So is that a Sharps that the protagonist is brandishing? Replica I assume if so. I would think an original would be in the 5 figure range and I would be reluctant to live fire it. Yes, that is a Sharps rifle pictured. And yes, using the real deal was kinda out of our budget range lol. Actually, we found nonfiring replicas to use for about $150 apiece, which was MUCH cheaper than trying to acquire firing replicas. This actually worked out pretty well because the state park where we filmed has a rule against uncased firearms; however, the park management was cool with letting us use nonfiring replicas as long as we had people on set to clearly explain the situation to any hikers passing by.